ExtremeStor B delivers maximum performance and scalability on fully integrated, top quality, industry standard hardware for maximum performance, reliability and data protection across a wide range of technical applications. 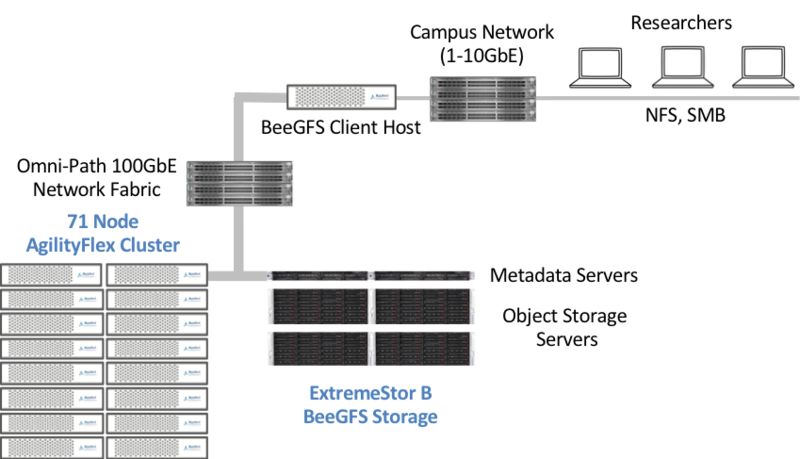 ExtremeStor B with BeeGFS distributes files in parallel across multiple storage servers with dedicated, distributed metadata processing. ExtremeStor B delivers up 8 GB/s client throughput with a single process streaming on a 100Gb network, with only a few streams capable of fully saturating the network. ExtremeStor B delivers best in class metadata performance with linear scalability through dynamic metadata name-space partitioning and distributing metadata operations per directory and subdirectory across metadata nodes in a simplified manner. A BeeGFS deployment at UCSB delivered over 13 GB/s with RAID 6 data protection. In contrast to other parallel file systems, BeeGFS uses all available RAM on its storage servers to quickly write bursts of data into the server RAM cache and to quickly read data from it. BeeGFS also serves data direct from the cache if it has already been recently requested by another client. BeeGFS also aggregates small I/O requests into larger blocks before writing them to disk. A single large file is distributed across multiple storage targets for high throughput. In addition to performance, BeeGFS was designed for easy deployment and administration. The graphical administration and monitoring system facilitates simple and intuitive management including cluster installation, load statistics, storages service management and health monitoring. ExtremeStor B is delivered as an integrated hardware software appliance from Applied Data Systems. BeeGFS Storage Pools make different types of storage devices available within the same namespace. Economic high capacity disks are accessed in parallel for high throughput and capacity, combined with a high performance flash tier. ExtremeStor BeeGFS storage servers come with underlying RAID (either RAID-6 or RAID-Z2) to transparently handle disk errors. BeeGFS includes a HA mechanism that is fully integrated and which does not rely on special hardware. This approach is called Buddy Mirroring, based on the concept of pairs of servers (the so-called buddies) that internally replicate each other and that help each other in case one of them has a problem. The built-in BeeGFS Buddy Mirroring approach can tolerate the loss of complete servers including all data on their RAID volumes – on commodity servers and shared-nothing hardware. Buddy Mirroring can also be used to put buddies in different failure domains, different racks or different server rooms. We’d love to work on your project. We do extensive analysis of your existing and future needs, deliver a comprehensive solution architecture on a validated hardware and software build that ships fully integrated. Contact us for a custom ExtremeStor B quote today!